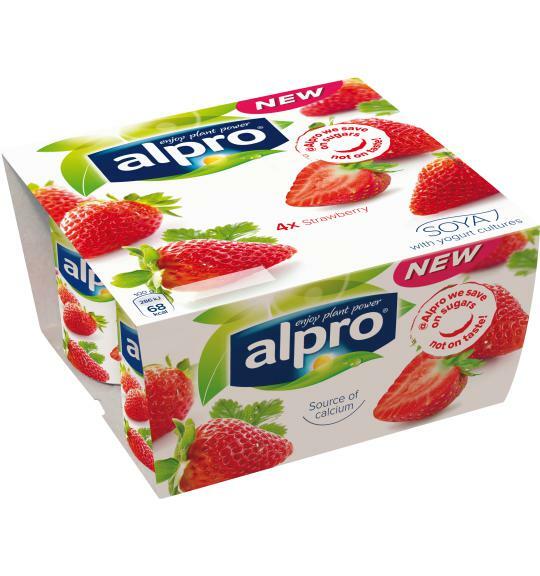 Enjoy the taste of summer all year round with Alpro Strawberry – four little pots of lusciousness just for one, with a delicious creamy texture. Stock up your fridge and tuck in when you feel a me moment coming on – enjoy them on their own or try with a sprinkle of nuts or your favourite crunchy cereal. Source of calcium. Contains vitamins B2, B12 and D.
May contain traces of nuts (no peanuts). Contains soya. Naturally lactose free & dairy free. Gluten free.